It’s the most gourdoues time of year! 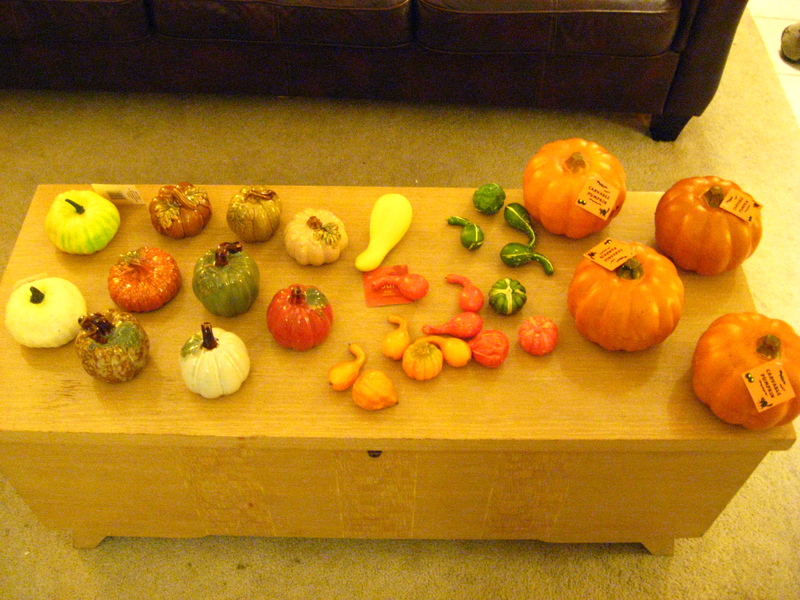 I couldn’t help myself, I’ve just got gourds on the brain. Especially after visiting the dollar store last night! They had the prettiest ceramic pumpkins! I may have gone a little overboard with the pumpkin hoarding harvesting. 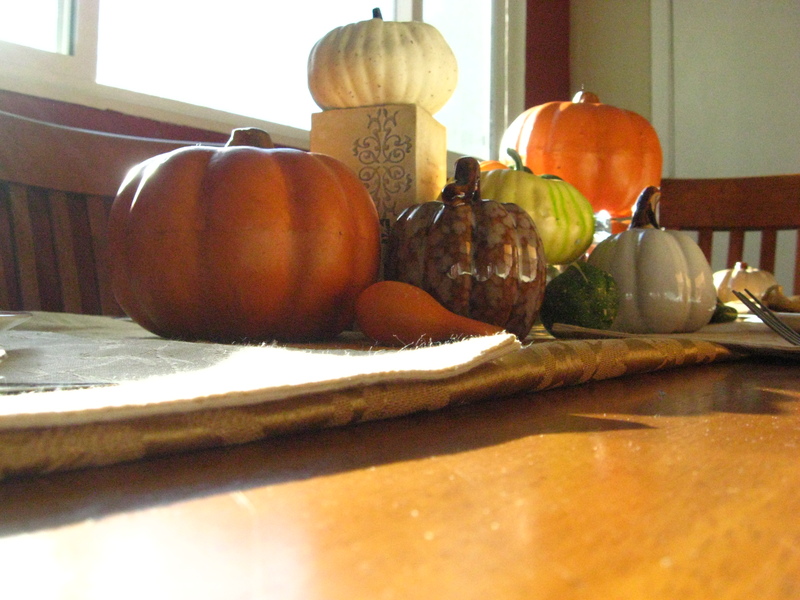 Amongst my ceramic pumpkins I also purchased some “faux” gourds. They won’t rot like the real thing, so if they survive a season in casa de April, I can use them next year! So here’s what I did with them once I got them all prettied up and unwrapped. All of the pumpkins and squash like items, came from the dollar store. Everything else I already owned. 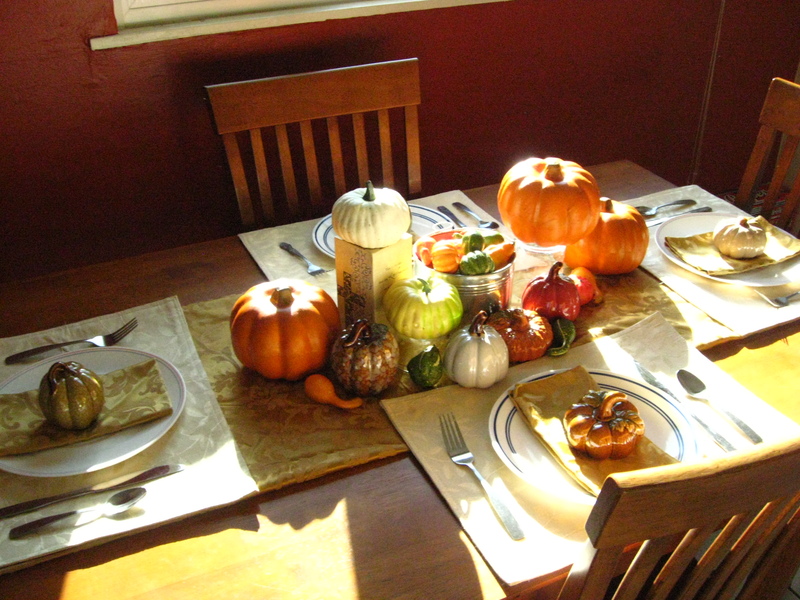 The table runner is actually a small round table cloth that I folded to fit like a table runner. The place mats I purchased, at the dollar store (! ), back in February. I raised some of the pumpkins by placing them atop upside down drinking glasses, and a pillar candle holder I got for Christmas last year. And the dinnerware of course, I have owned since my first college apartment. Speaking of which it might be time to buy some more “grown up” dinnerware. A girl can only use her mom’s 80’s goose plates for so long! 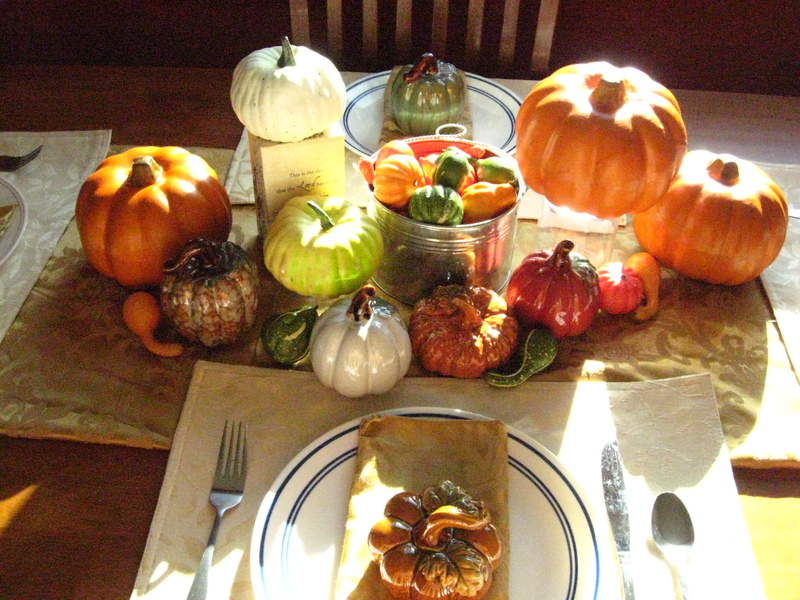 Doesn’t it make you want to GOURDge on a yummy harvest inspired supper with pumpkin pie for dessert?! There’s linky parties happening!! Visit Hooked on Houses and The Nester for some more fall decorating eye candy!! And link up if you have a blog!! Get your mind outta the gutter! I’m talking about ice cream cones here! Oh, you knew what I was talking about? Well, I guess I’m the only one that thinks cones belong on a road. Construct cones…ya know the orange ones. Anyways, to end the awkward silence, a couple months ago, I posted about Blue Bell ice cream, which by the way is the best, most yummy ice cream in the world. OK, maybe second best, I’d have to say that Caliches in Las Cruces is the best, but that’s a whole different post. My most recent discovery, or should I say the sweetie’s most recent discovery, as he does all the grocery shopping (Yeah, I know, he’s a gem, and he’s mine, and no you may not borrow him! 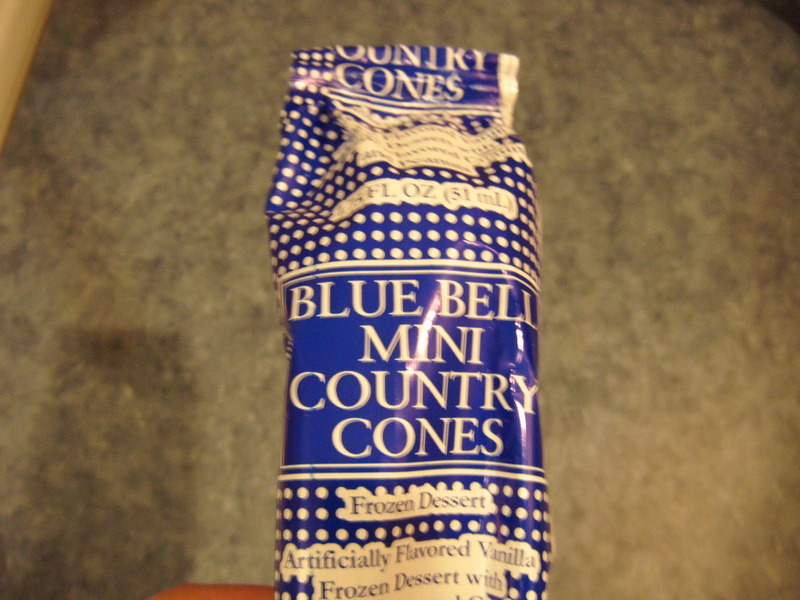 ), Mini Country Cones by Blue Bell Ice Cream. 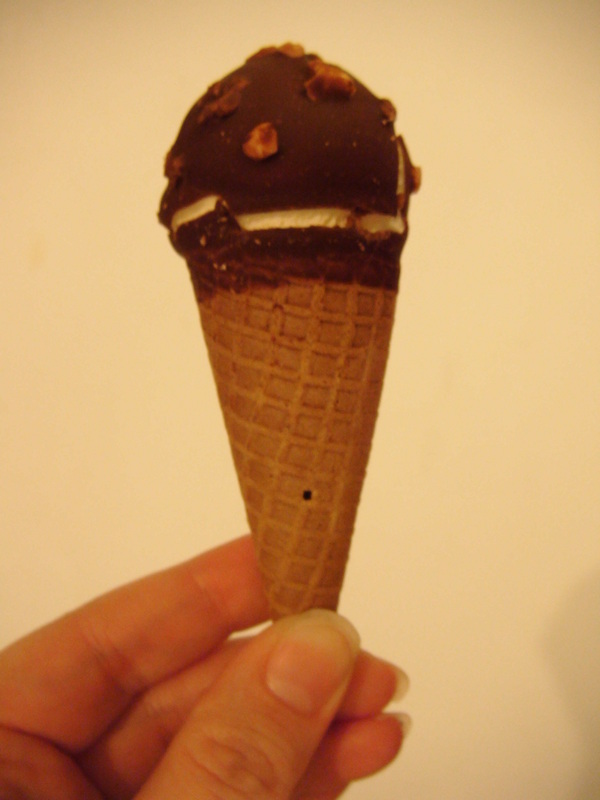 They are 90 calories a cone, and have vanilla dipped in chocolate with walnuts on top, there’s even chocolate at the bottom of the cone! Needless to say, I was one happy camper. And at only 90 calories a cone, that means they are good for you and you can eat more of them right?! It’s that kind of thinking that can get a girl into bigger jeans! I think mine just whimpered a little. 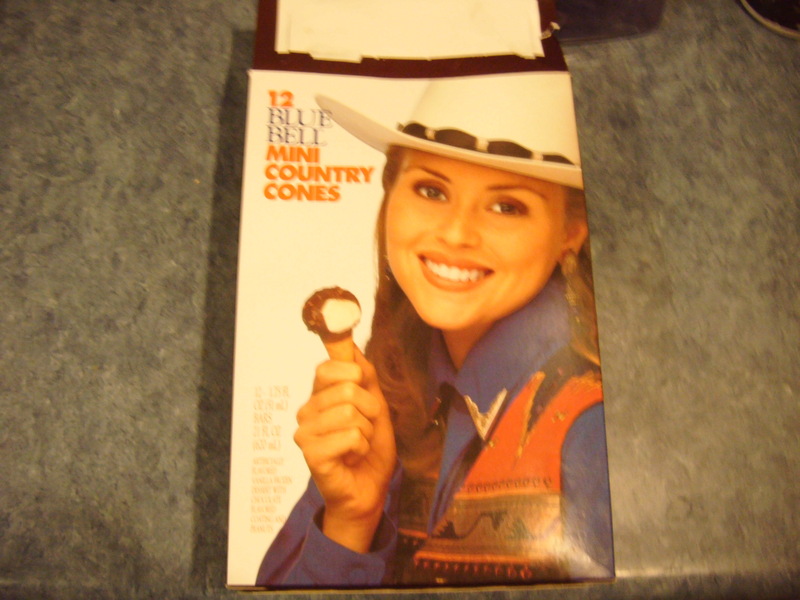 But I digress, the Country Cones are awesome if you are like me and need to watch a waist line, just be sure to only eat one. And no, not one every hour! 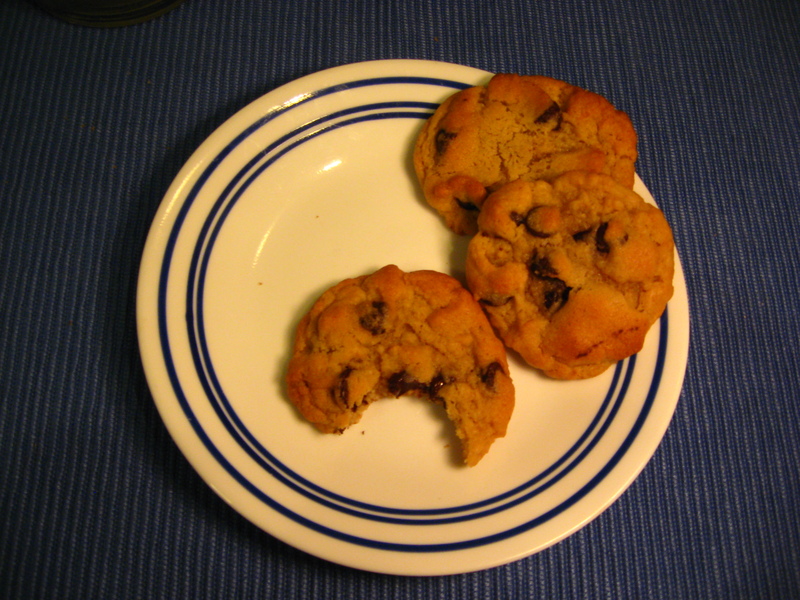 Recently, the sweetie was being his normal sweet self, and baked some of his famous dark chocolate chip cookies. And of course I ate my cookies without any inhibitions, because come on, a girls got to have her dark chocolate chip pecan cookies. Nom, nom, nom, nom, nom, nom…. Enjoy with a glass of milk!! With the onset of bronchitis, that’s lasted a month and still going strong (! ), I really haven’t gotten a lot of my projects done, or started for that matter! But I have been able to surf the web for some pretty design trends. 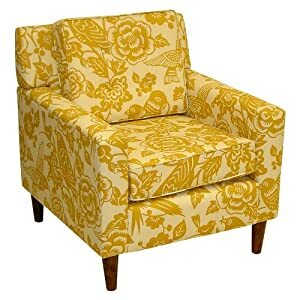 Currently, I’m really liking bright furniture. Especially in rooms with a dark wall color, or more of a subdued tone. 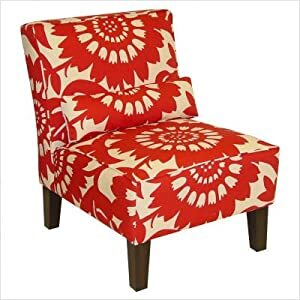 The cheerful tone of these furniture pieces is like a bright lipstick when you don’t have time to paint the rest of your face, they add that extra somethin’. Like these photos that I found on Opal Never Shouts. Brightly colored furniture I love, but alas, I also have an affection for brightly colored walls as well, it might be too much include both. I can’t have my guests walking in and instantly have a headache with all the color. Yep, that’s right, I finally completed a home improvement project! Are you ready to hear about what it was?? I know your itching to find out! 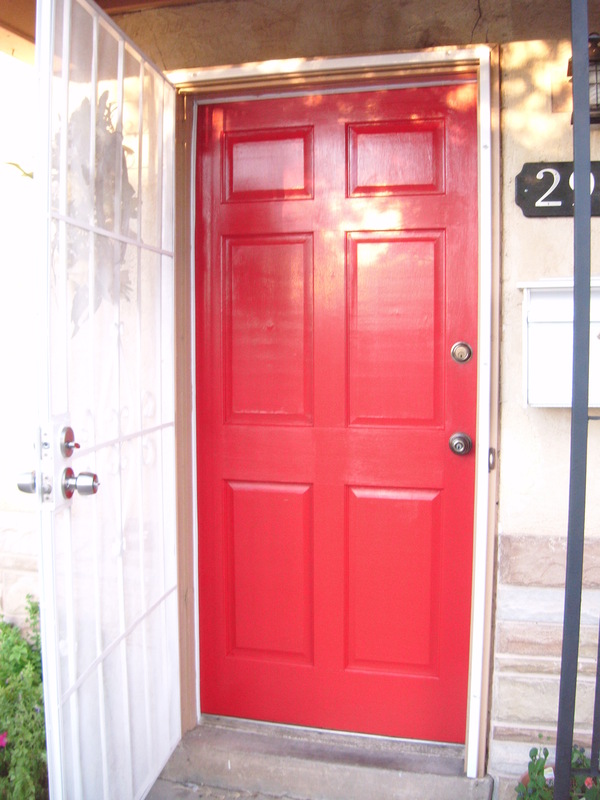 Drum roll please….I painted my front door red!! I used Behr Cherry Tart, it took two coats on both sides. Yep, I painted the inside red too. It was slightly nerve racking, deciding whether to paint both sides red, but ultimately I’m glad I took the plunge. Sorry about the dark photo, the lighting in my living room isn’t quite the same with the door is closed. And I was just too exited to wait for the hardware to be put back in place, I had to take a photo! I’ll make another this evening with the hardware in place. That way you’ll get to see a final product from the inside! As mentioned above, I used Behr’s Cherry Tart. It was a close race between Cherry Tart and Bijor(?) Red. The winner is on the left and the not so lucky contestant is on the right. 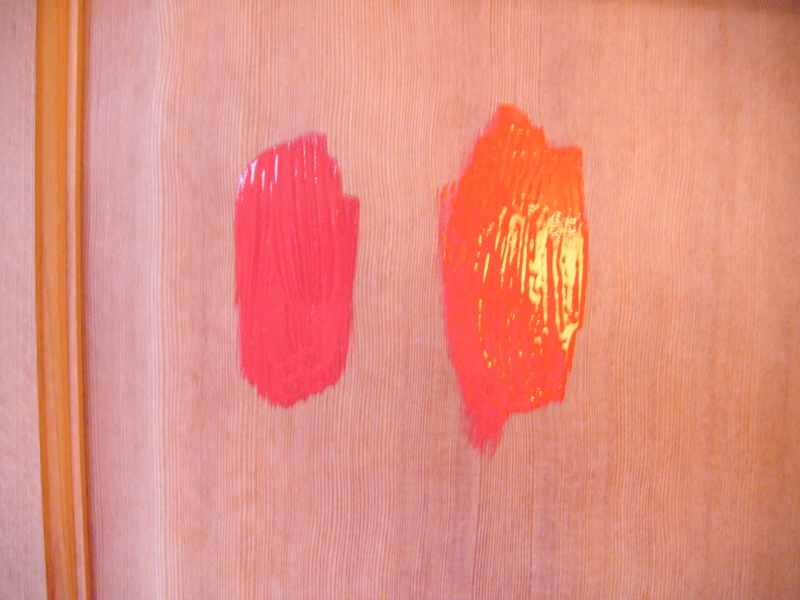 As you can see, the latter had more orange in it. Both colors are pretty, but the red tone works better with the “tone” of our casa. As always, I forgot to take a before picture, but from the picture above you can see that my door was naked wood. It didn’t have any type of finishing, so hopefully my Cherry Tart paint will help her have some modesty!! 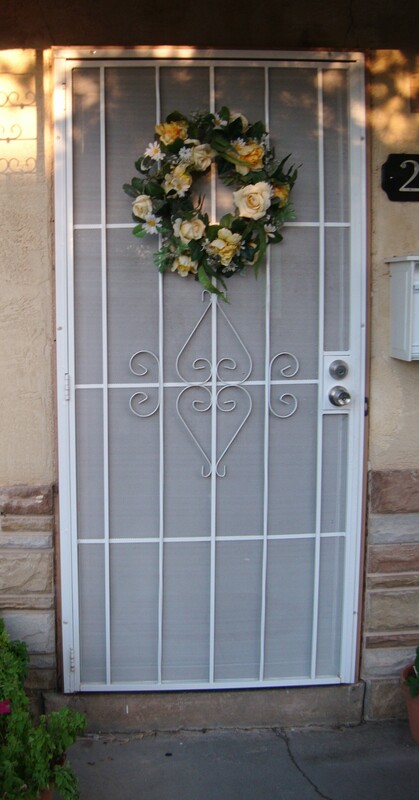 I’ve considered removing this door for better curb appeal, but it does keep the bad people out, and it brings in a lot of light. 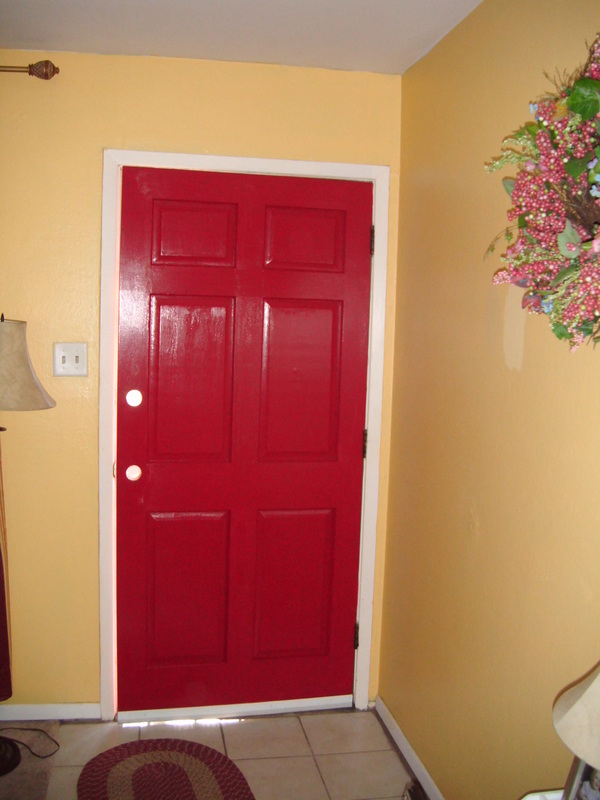 Since my red door makes me so happy, maybe I will paint this door red too. Or I could stop while I’m ahead and paint the town red instead! Ha, don’t you love rhymes!